Ever wonder what to do with leftover sweet potatoes? Here’s an easy way to make a quick soup and use them up. It is really quick if you have an immersion blender. This recipe is different from the first one I posted–it’s a variation on the leftover sweet potato theme that features miso. Miso, or fermented soy or chickpea paste, is not in most people’s kitchens–if it hasn’t been in yours, consider keeping some in the fridge. It is a good source of probiotics (don’t add it until the end of cooking so it doesn’t get cooked) and adds to the flavor of many soups. In fact, you can add only miso to a bone, meat, or vegetable broth and it makes a delicious soup (1 tsp of miso to 1 cup of broth). Traditionally, miso is made from soybeans but there is a soy-free chickpea miso that is made by MisoMaster that I like very much. Either could be used in this soup, but if you use soy miso use the mild kind–it’s called mellow white miso. In a medium sauce pan melt the ghee or butter over medium heat and add the chopped onions. Stir every minute or so and continue to sautee until the onions are soft for about 5 minutes. Add the spices and stir well. Add the sweet potato (cut into chunks) and the broth or water and keep on medium heat with an occasional stir until it simmers. Add coconut milk. Heat another 5 minutes or so. Take off the heat and blend until smooth and creamy. Add miso and blend again. Taste and add salt and pepper as desired. Serve immediately. If you have leftover sweet potatoes, try this easy, dairy-free recipe. 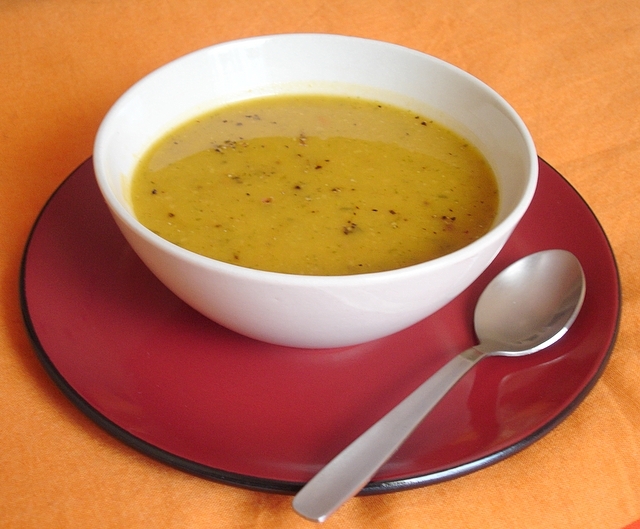 Next time you prepare sweet potatoes, bake a couple extra and use them for this soup the following day. Saute onions in olive oil in a medium-sized soup pot until soft. Stir in spices. Add broth. Stir over medium heat until it simmers. Add sweet potatoes and more water if necessary to reach desired consistency. Add coconut milk and stir well. Salt and pepper to taste. Bring to a simmer before serving.